See here for more Washington, DC weather records. 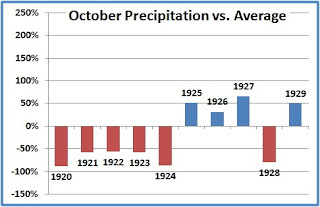 PM Update: Added chart of October 1920-29. With 1.23" of rainfall yesterday, and an additional 0.79" through this morning, the preliminary October rainfall total for Washington stands at 5.59", over 70% above the long-term average for the month. 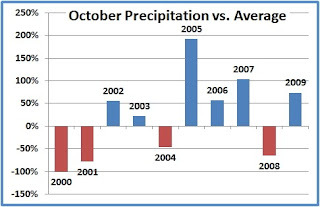 This precipitation excess caps off a decade of October extremes. The 0.02" in 2000 was the second lowest since records began in 1871, and the 9.41" in 2005 was the record highest. The last 5 consecutive Octobers, and 8 out of the decade 2000-2009, have all been at least 50% above or below the long-term average. The only other decade in which there have been more than 6 such extremes was the 1920s, when there were also 8. This decade's extremes have all been at least +/-55% of average, however, whereas 1925 barely made the 50% level at 50.9%. Of the 8 extreme Octobers this decade, 5 have exceeded on the up side and 3 on the down side. 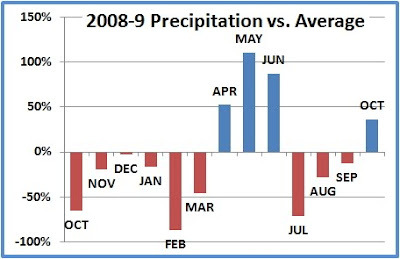 The 1920s, on the other hand, excelled on the dry side, with 6 of the 8 extreme months below average. 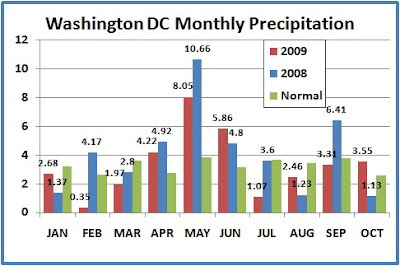 The nearly 1" of rain which fell on Friday and Saturday, combined with the heavier amount the preceding weekend, has moved October's precipitation in the Washington, DC area from the large deficit of the first half of the month to a solid surplus. The month-to-date total of 3.55" at Washington National is 37% above the average through the 25th and is above the average for the entire month. Along with the 1"+ amounts forecast for the upcoming 5 days ending on Halloween, October has a good chance of joining April, May, and June in being 50% or more above normal.